When doing a site visit, it can be difficult to envision how the space will look once it is set up for a specific event. This is especially true for unique venues where the event space may be one of a kind. IMS recently provided an iPad loaded with a virtual tour of the facility to the Franklin Institute in Philadelphia to improve the experience of both planners and the venue. The tour includes 360 degree views of different event spaces, similar to what you would see on Google street view, and include the option to open photo galleries or videos of the space. There are also several sets of pictures loaded onto the iPad from events IMS has executed at the Franklin Institute. These illustrate different options for setting the Institute’s unique space, and have assisted planners in creative approaches to laying out events in this distinctive venue. IMS’s stellar creative and design team has worked closely with several clients of the Franklin Institute in bringing their visions to life and providing a memorable experience for their attendees. Take Ben Franklin Memorial Hall as an example - the room centers around a statue of Ben Franklin, and when planners visit it may be during the day amongst a crowd of families enjoying the Institute’s exhibits. 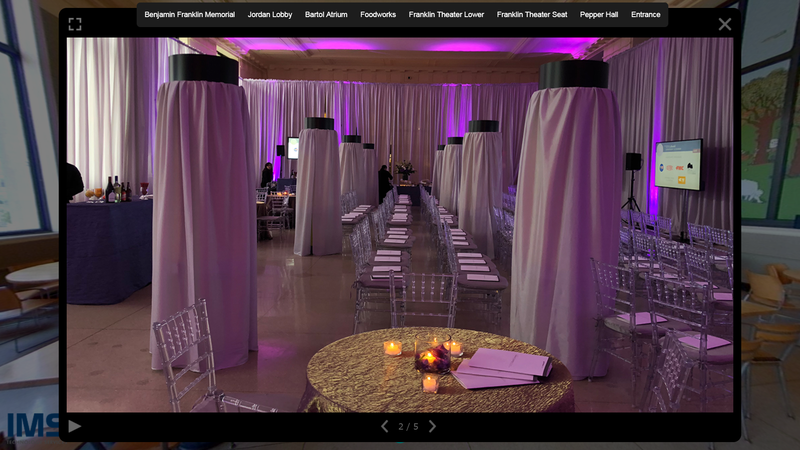 With the virtual tour, planners can refer to photos of the room set for an evening event with furniture, staging and audio visual while simultaneously walking the space. Planners can even see a video from an event where IMS projection mapped onto the Ben Franklin statue and interacted with event attendees. As meetings and event professionals, we know there’s no substitute for being there in-person. That said, if planners aren’t able to visit the Franklin Institute they can also view the virtual tour online. IMS is always experimenting with new applications of technology. If you have a need for virtual tours, video production or projection mapping, or if you’re looking for a creative solution to any challenge, please don’t hesitate to get in touch! Article written by Greg Kamprath, CMP, IMS national account manager.